6 ingredient Ninja Foodi or Air Fryer Corn Casserole is the perfect side dish for holiday entertaining or weeknight. 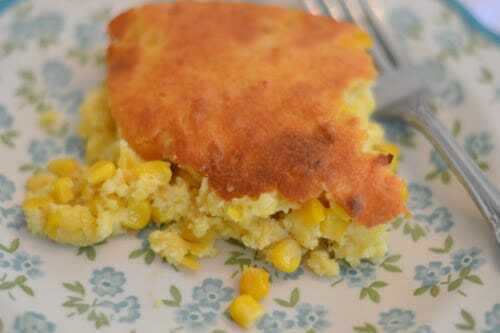 Corn casserole made with Jiffy Cornbread Mix is easy, satisfying and the total comfort dish. 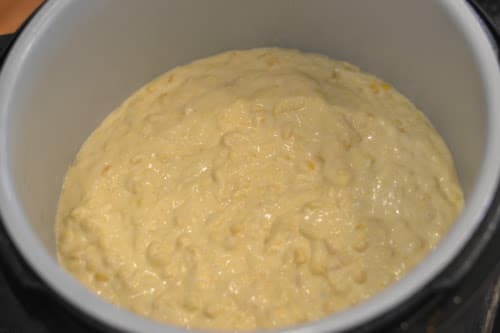 I love making corn casserole at Easter, Thanksgiving, Christmas, and more. But, I also make this on occasion for our weeknight dinners. I pair with meatloaf, baked chicken, and other dishes. This is such a hearty and savory side dish that our family can’t get enough of. If you haven’t tried Air Fryer corn casserole, you got to give it a try! You will find a handful of variations of corn casserole on the internet. This is my one and only go-to recipe anytime I hear the family asking for corn casserole. It is easy, minimal ingredients needed, and quick to whip up. I always try to keep the ingredients in my pantry in case we get the craving. This corn casserole is also delicious to serve up for cookouts. Pair it with some grilled burgers or steak and you have one outstanding side dish. Let’s just say there is really never a wrong time for a simple corn casserole in my book. Corn casserole is a creamy and buttery dish, that is baked in a casserole. You generally have a delicious and slightly crisp golden crust, with a soft and moist center. 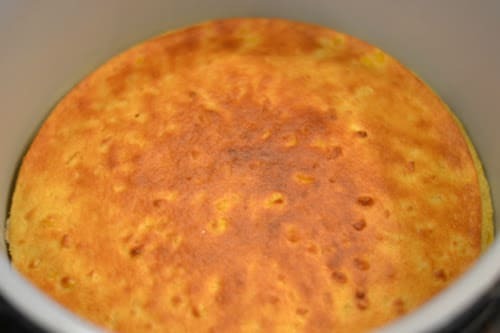 Corn pudding has a pretty custardy style center, where corn casserole is baked to a more bread-like center. But, they are pretty much the exact same thing. I hear that not everyone can find Jiffy cornbread mix in their area. You can use any other brand that is the same size on ounces. Take into factor some box mixes have a sweeter or savory aspect so buy a brand you enjoy. If you want to add cheese go for it. Some enjoy that cheesy corn casserole taste, so add 1/2 cup of shredded cheese into your mix and bake it up! You can double corn casserole, but when cooking in the Air Fryer or Ninja Foodi you won’t have enough room. You can always swap to baking in the oven so that you get a doubled recipe if you prefer. Start by spraying down your pot with a cooking spray. Mix your ingredients together, pour and bake for the time listed below. You will see the Air Fryer has a lot faster cook time, but you are welcome to do Ninja Foodi or Air Fryer! Keep any leftover corn casserole in the refrigerator once you are done serving. This will last up to three days in the fridge when stored at the appropriate temperature. 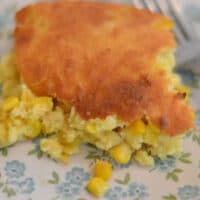 Give this corn casserole recipe a try in your Ninja Foodi or Air Fryer today. A really incredible dish that is great for any occasion. Even think about taking this to a potluck dinner! In a large mixing bowl, mix together the ingredients. Make sure al the ingredients are mixed well. Pour mixed ingredients into your pot. Air fry at 320 degrees for 12 minutes, checking with toothpick for doneness.